Birds know what to do when the seasons change. Animals live on instinct, but they are also connected to something bigger than themselves. And if you look at anything in nature, the same is true. A tree somehow knows how to be a tree. It knows when to shed its leaves and when not to. Do you see yourself as a part of nature? We often believe we’re excluded, but we aren’t. We are made of stardust. We are inherently a part of our planet, our universe, and our galaxy. You have an inner GPS waiting to guide you. And your life is heading in the direction it is supposed to be heading in whether you want it or not. This is not about trying to control life. It’s about letting life unfold and listening to that whisper inside you. Because that whisper is what will help you live a passionate, fulfilling and meaningful life. 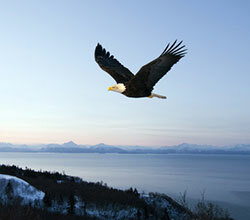 Just like a bird knows what to do to live life, so do you know what to do, but you have to be willing to listen. You have to let go of wanting to figure life out. It seems counter-intuitive, but in order to live the life you want, you have to be willing to let go of the ideas you have around it. You have to put on a new pair of sunglasses. People who can’t find their passion often believe they have to find something they don’t have. But in reality, you already have passion in your life. You already feel fulfilled sometimes. The key is to focus in on that. The secret is to look inside instead of outside. Stop asking people for permission to do what feels best for you and just do it. When I say look inside, I’m talking about noticing what you’re interested in, excited about, what makes you fulfilled and what fills you with purpose. The way you follow your inner GPS will be different from me. I mainly feel my way through life. For example, we just bought a house, and it was both stressful and fascinating. Each time we went to see a new house, I took in what I could, but I never made a quick decision. I slept on the house (not literally, of course), and sometimes I did so for several weeks. Then suddenly a house came a long and it felt right. Everything just happened. I found myself making a bid, and it was accepted. This doesn’t mean I was fearless. Buying a house is a big, scary decision for most, and it was for me, too. But I listened to my GPS, and I let what needed to happen happen. People who trust themselves are happier, more fulfilled, and often more successful. They know that what ultimately matters is what works for them, and how they feel. When you think you have to follow someone else’s rules, you end up feeling confused, frustrated and lost. That’s why I keep pointing you back to yourself. You are here to live your life, not someone else’s. One day you will die. You might even die this week. So make the most out of what you have right now. This can be scary. Often brutal. It feels like nothing makes sense. But that’s a sign that you’re jumping out of your comfort zone and doing something you’ve never done before. You’re going after the life you know you deserve. And that’s what my upcoming book is all about. 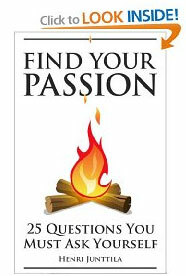 My book, Find Your Passion: 25 Questions You Must Ask Yourself, is about 25 powerful questions that help you turn up the passion, meaning and purpose in your life. Because when you truly look at things, you realize that this isn’t about finding your passion, but about expanding the passion that’s already there. Do you already know what your passion is? 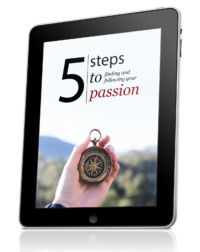 In this book, we’ll dive deeper into what we’ve covered here, because you already have everything you need to live a passionate life. You have everything you need to feel fulfilled. What’s stopping you is you. The bottom line is that when you start listening to yourself, everything changes. There’s no one you have to be. There’s nothing you have to do, except let life happen. Hi Henri, I’m looking forward to reading your book! I’ve found my passion (well, many of them in fact!) and I can attest: your formula is a good one, and a very reliable approach. I enjoy the reinforcement of these ideas in your book and blog. It’s what has always worked for me– through travels, living abroad, starting businesses, wild independent projects, and relationships. Good luck and enjoy the launch! Glad to hear that, Justin! The longer I’ve been on this journey, the more I’ve realized how much everything changes, and the only way to live life is to be flexible, or in other words, follow your excitement, intuition, interests, passions, or whatever you want to call it. Good advice. I like your example of buying a house. It is a most scary process. I’ve also found that eventually you find the right one and you know it’s the right one. Thanks Henri! you’re amazing and I wish you more success! ~ peace and love to you and your family. So true what you say … And actually so logical, but I never ‘see’ it .. Only when you tell I think “oh yeah, of course’. Henri, Good post! Trusting yourself enough to make your own choices and believing you are enough to get through anything might be scary, but it’s the only way to live an authentic life — any other life is second rate. Works for me! i look forward to your book, Henri. Discovering that is priceless. Thanks for the reminder Henri … great post! Thank you for your generous gift. Looking forward to Wednesday. Wishing you tremendous success with your book and joyous, memorable times in your new home. What is attractive ‘out there’ gives us information on what our passion is. Henri ,you are wise beyond years 🙂 and this is evident when anyone sees your perspective on life. You are very intuitive and helpful.I hope you could help us more with your new book.I am very eager to read it . Thank you for sharing your knowledge with us. Great post Henri – I like the idea of the inner GPS. I think you’re right too, a lot of us already know where our passions lie – it’s a question of whether we’re brave enough to follow them! But it doesn’t have to be a bit all or nothing – we can move towards our dreams one step at a time, be they baby steps or giant strides. Great book! I just read it and left you a review on amazon. I wish the book had been available 2 years ago, but I enjoyed it now! And I agree with every word…having just gone through the journey. Great job! Good luck with it. I’m so happy to be a part of your group. I really enjoyed reading your article, particularly where you told the story about how you chose your house. Most major decisions in life are difficult to make, since we are all afraid of making the wrong choice. As most choices in life are not black or white, choosing the right shade of gray is a bit scary. Personally, I am faced with making a choice about a career option; I think I’ll go with what my heart says. great post! I agree that finding your passion and what you truly are living for is the single most important thing people need to do. Being in my 20’s its around that age where I need to know where I’m going in life. I’m proud to say I already found my calling. People need to stop hesitating and start living their life!